Weinberg freshman Margot Bartol and Communication freshman Arianna Staton. Bartol and Staton proposed the resolution calling for the University to take greater action in the wake of recent violent incidents. 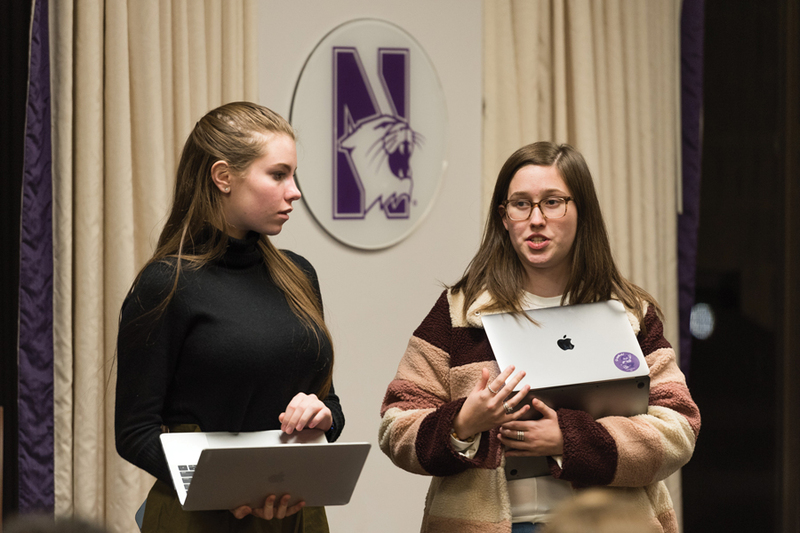 Associated Student Government passed emergency legislation Wednesday calling for Northwestern to make greater efforts to protect its students in the wake of several recent incidents on campus. The resolution also suggests security officers who work in campus residential halls start their shifts earlier to account for the lack of daylight. The most recent incidents have reportedly taken place around 5 p.m., before these officers begin their shifts. In an email to students on Nov. 9, University Police Chief Bruce Lewis said UP have increased patrols and are currently working with the Evanston Police Department to “ensure a safer environment” in the wake of these incidents. The Senate’s resolution notes the fact that there was over a week-long gap between the October incident and the UP alert. Lewis answered questions about the gap in communication between UP and students. He said when the first report came in, they had no indication that it would become a trend. He added that the second incident didn’t prompt a response because the suspect was apprehended. It wasn’t until the third incident on Nov. 8 that UP acknowledged a connection between the encounters, he said. In response to questions of personal defense, Lewis told students that pepper spray is “not prohibited,” noting that it was once sold in the campus bookstore. Lewis’ explanation prompted an amendment to the legislation, stating that the Office of Student Conduct should make the pepper spray policy more transparent. The legislation also asked for an increase in the availability of SafeRide services, despite some senators’ concerns about the feasibility of this plan. Both amendments were approved, and the Senate voted unanimously to pass the finalized resolution. Speaker of the Senate Adam Downing praised Bartol and Staton for their work on the resolution. Senate also approved a $1,000 grant through Wild Ideas for BlackBoard, Northwestern’s only black-interest publication. BlackBoard recently lost funding from Medill and a national sponsor, making ASG’s support a critical factor in enabling them to print next quarter. Senate also passed a resolution asking NU to reaffirm its support for the Jewish community on campus as part of an ongoing response to the October synagogue shooting in Pittsburgh.